I could not believe it when I woke up this morning. I looked out the window and it was a clear, sunny day with no wind! So I quickly had my corn flakes and set off up the mountain to La Hoya. When I got to the base of the chair lift, I could not get my boots on quick enough. Up the T-bar I went and did a quick practice run on the Plateau piste and then headed for the Sol Poma. I did a few runs there trying to get used to the new snow that had fallen over-night. I was not skiing it very well because it was a bit heavy and it takes me a while to get going. 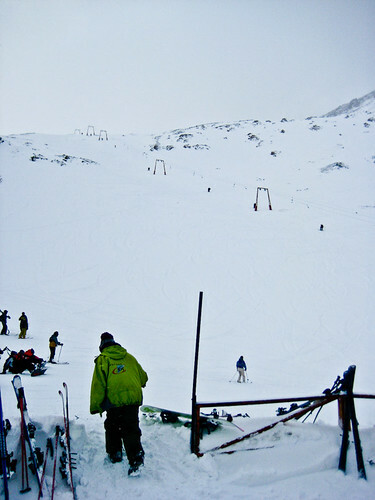 After that, I went over the other side of the ridge to the Estadio piste and rode the fresh snow in the gully. I was starting to manage the heavy drifts of snow after a few runs, so I headed over towards the cornice and did a few runs down the La Luna alternate piste. After a few runs, I had some lunch and then met Pat from Canada and Pat from Utah and did a few runs down the Luna run. Here is a wide shot of the run, showing the fresh snow and the tracks. You cannot really tell how steep it is from this photo. But it is quite steep. I did a few laps with the 2 Pats and then lost them somewhere. In the afternoon I met up with Scotty, Rochelle, Nacho and Gustav and they made me follow them to the Avalancha run, which is underneath the cornice. I have been freaking out about going up there for a month, so I finally plucked up the courage. I was totally freaking out going across the top of the cornice because it was very narrow and a bit icy, and I kept having these visions of me going over the edge and crashing onto the rocks. Eventually I made it to the other side of the Avalancha and made my descent. I was so freaked out. I just made a few massive turns and tried to get down the hill the easiest way possible. The snow was not all that good, but I really needed to go down the run. I was so terrified of it. When I got down the hill I just whooped and whooped, letting out all the adrenaline I had built up. It was a tremendous feeling to face my fears and just do it! The last couple of days the snow has been coming down in bucket loads. I think we have had about half a meter in a couple of days. Yesterday we could not go skiing because La Hoya ski resort was closed because of strong winds. This morning I got up hoping to go skiing but it was closed again because of the wind. But the ski resort opened at mid-day so me and Bruno and his mates got a taxi up the hill. It is not too expensive if four people share a taxi. It costs about 15 pesos each. That is about four dollars. When we got up the hill there was snow everywhere. It had been bucketing down snow for 2 days. I quickly got my skis on and headed up the hill. The bottom chair lift was working but only the T-bar was working up the top. Here is a view of the T-bar and the run next to it. I tried to ski the fresh snow but without much success. It was a bit heavy and wet for me so I just stumbled around trying to do some turns but mostly I went down the hill out of control. One day I will be able to ski. After a few runs and quite a few stacks, I headed into the food center and met up with Bruno and his mates and had a bit of lunch. The wind had been picking up during the afternoon and the visibility was not so good. A poma started up so I skied a piste for a while. It was so silky and smooth skiing on some fresh snow that had been groomed. But after a while the poma closed down because of the wind and I made a couple of more runs and then called it a day. I got a lift down the hill with one of the instructors from the Refugio. 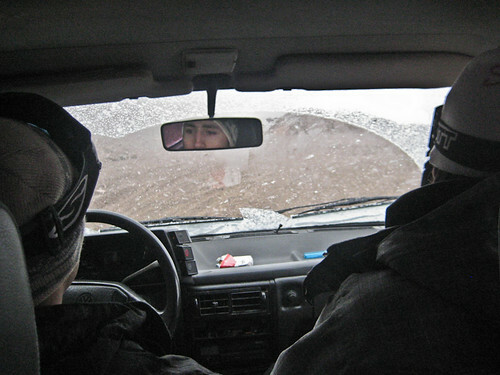 By that time it was snowing very heavily and continued to do so all the way down the mountain to Esquel where it turned to sleet. Here is a shot from the back seat of the car as we are driving through the snow. It was puking down all day at La Hoya today. This morning we set out from Esquel but had to get a taxi because it was too wet for hitch-hiking. The rain was bucketing down. Talon and Lisa thought of the idea and then we decided to share it with Bruno’s mates who needed to get their snowboards up the hill. We had to order a taxi with some roof racks and then when the dude came, he did not have any ocky straps, so we had to go to his place and get some to tie the snowboards down. We finally started up the hill after a scenic drive through downtown Esquel and half way up the mountain the rain turned into sleet and then snow. When we got to the base of La Hoya it was fully snowing. 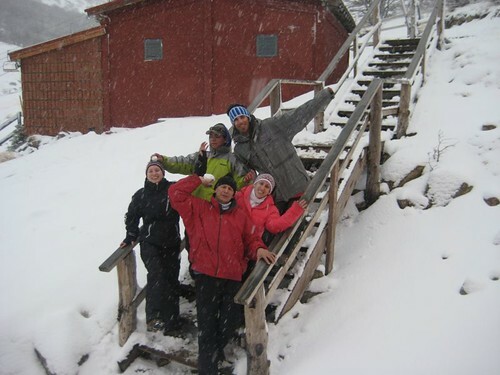 The above is a photo of the crew from the Refugio Slalom. A couple of them are waiters, the lady who organises the ski school, Lukas, who looks after the hire gear, and an instructor. They are very nice people and I got to know them very well when I stayed up the mountain. I finally got up the mountain and started skiing but it was really hard to see anything. There was lots of new snow. It was hard to say how much but I would guess at more than ten centimeters. I could not ski at all, I just kept getting bumped around and skied like a goose. But I did do quite a few runs trying to learn how to ski in blizzard conditions. Eventually I stopped for lunch and met Talon and Lisa in the Piedra Confriteria, where I tried to dry out for a while. After a cup of hot chocolate and a slice of pizza, I went back out into the snow. By this time, however, the wind had picked up and it was really difficult to see anything. I could not even see the cat track to get back to the bottom. I gave up after that. Late in the afternoon, I went out to hitch-hike back down the mountain. Scott and Rochelle were waiting too, so we waited for more than an hour whilst it started getting heavier and heavier snow-fall. We ended up getting covered in snow so I desperately asked a couple of lifties if I could ride in the back of their ute back into town. Thanks, guys. It should be puking down snow all night so hopefully tomorrow or the next day we will get some fantastic skiing done on some new snow. Disclaimer: These prices are at August, 2010. Check the current prices for yourself. For example, lift prices from 2009 to 2010 had jumped massively. Also, there are 3 seasons – high, medium and low and prices jump around accordingly. Check yourself at the resort web sites for when the seasons are. First off have a look at airline search engine at skyscanner.net – there you will find the cheapest flights in the month, pick the whole month. or Sydney to Santiago, Chile. Whatever you get it is going to be expensive, so cop it sweet. Most hostels in Argentina charge about 45-50 pesos a night or about US$12. You can book through hostelbookers.com or ask the hostel that you are staying at to book the next hostel you are going to. If you want to stay in some swanky hotel, then you are reading the wrong page. 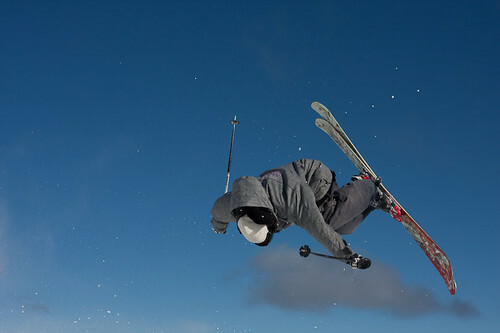 Las Lenas is the trendiest and most expensive of the Argentine ski resorts, but from all reports has some of the best expert skiing in the Andes. A Season Pass is more than 4000 pesos. It is 70km from Malargue, where there are some hostels for about 50 pesos per night. 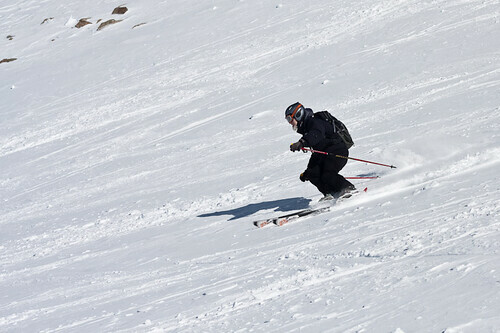 Los Penitentes is 2 hours from Mendoza with 25 pistes, about 10 lifts and reports of great off-piste skiing. Campo Base Hostel offers a week’s accommodation with breakfast and lunch for about 500 pesos per week. A 7 day lift pass costs from 700-1000 pesos. Catedral is 19 kilometers from Bariloche, where there is an abundance of reasonably-priced hostels. The killer is the cost of the season pass which is more than the most expensive in Australia, at AU$1600. 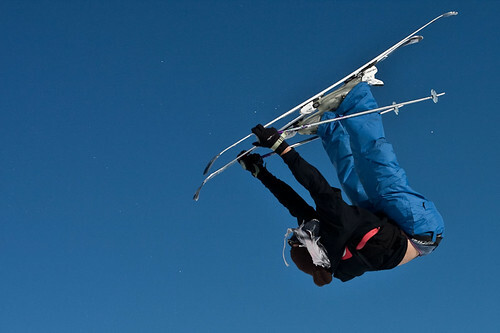 But there are more than 53 pistes and tons of great skiing from all reports. 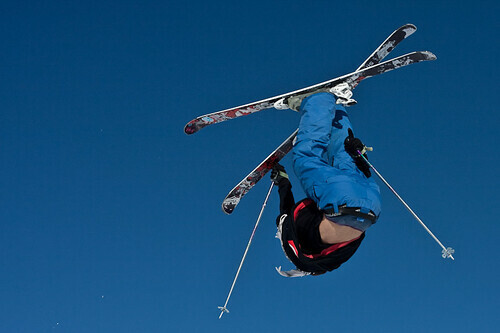 Chapelco is 20 kilometers from San Martin de los Andes and has 20 pistes for all ranges of skiers. 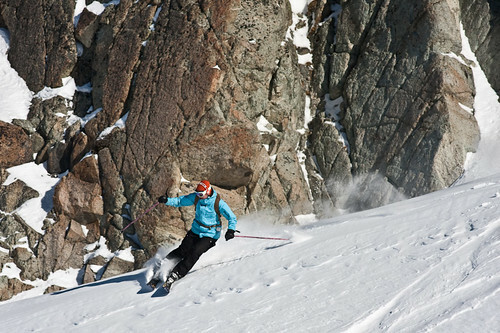 It has reputedly some of the best skiing in Argentina. A month ski pass costs from 2500-4700 pesos. La Colorada Hostel charges about 50 pesos per night in San Martin de los Andes. 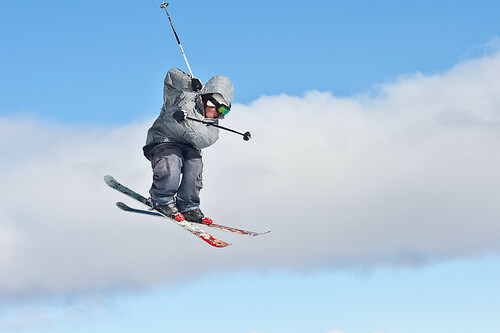 Caviahue is a small ski resort 19 kilometers from Copahue with 10 pistes and 8 ski lifts. Cerro Bayo is is 15 minutes from Villa La Angostura in the province of Neuquen. There are 20 pistes and 12 lifts. There are a few hostels in Angostura. Hostel La Angostura costs about 60 pesos per night. A 7 day lift pass costs from 500-900 pesos. 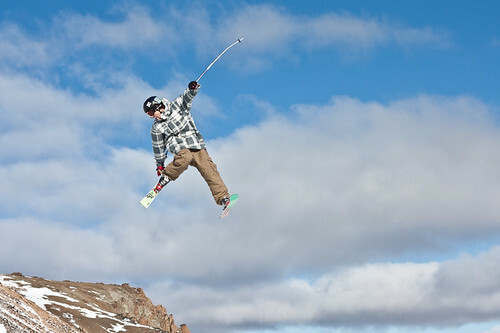 La Hoya Ski Resort is 13 kilometers from Esquel. There are many hostels in Esquel for about 50 pesos per night or cheaper if you pay by the month. A season pass for foreigners is 3000 pesos (~AU$900). 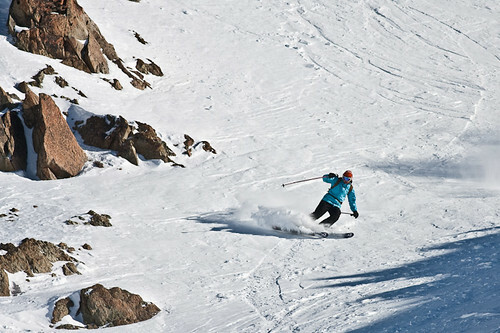 The bowl at La Hoya is quite good for off-piste, and there are chairs that will access a fair bit of off-piste skiing. 25 kilometers from Ushuaia where there are masses of cheap hostels to stay. 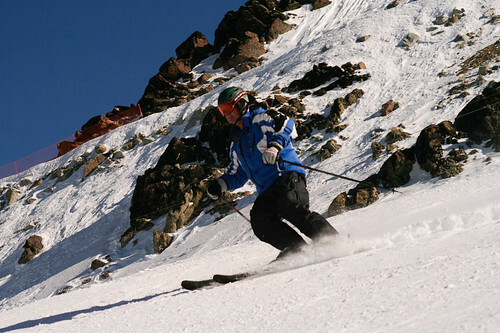 Cerro Castor has 28 pistes and 9 ski lifts. I thought Australian lift passes were the most expensive in the world but Argentina beats us hands down for expensive season passes. Easting out can be expensive unless you work out where the ordinary people eat cheaply. I have not found out yet. I found that by cooking my own meals that it was relatively inexpensive. Some vegetables like carrots, pumpkin, onion, tomatoes and spinach are a good buy, but meat can be quite dear. Bread in baguettes form are the cheapest and most delicious option. There are pretty big supermarkets in most towns. You can usually find bargains there and they have a good range of food. They sometimes have pre-prepared sandwiches or rolls for a very good price. I highly recommend the ham and cheese rolls for about 3 pesos. Breakfast is usually included with the hostel tariff and usually consists of a couple of croissants(Media Luneas) and a cup of coffee. It did me fine but you can get muesli or cereals in the supermarket if you need to. Fruit juice is awesomely good and is really cheap. I highly recommend the Baggio Multifrutal. Buses are very good with seats that fold back into reasonably comfortable sleeping platforms. Even I was able to sleep on the buses in Argentina. For example, a bus from Buenos Aires will cost 350 pesos and take 25 hours. I do not like such long bus trips, so I split up my trips into manageable 8 hour chunks. But that ends up costing more. It is probably better to get long-distance travel over in one lump and get it over with. For example, Buenos Aires to Bariloche or Esquel will cost from 250-300 US dollars. Foreigners will be slugged extra for the pleasure of being an extrano. There are a number of internal airlines – LADO, Andes, Aerolineas Argentina, LAN Argentina and a number of other regional airlines. Check their websites for prices. It is probably heaps cheaper to fly during the week, rather than the weekend. This morning I got up nice and early to go skiing hoping that there was some snow overnight. I was heading out the door when Nacho told me that the lifts were closed because of strong winds. doh! I had to turn around and wait until mid-day when the lifts were supposed to open up. But after 12, Gus rang up the ski resort and they were not going to open the lifts at all that day because the wind was still howling. Double doh! So these nice people from Buenos Aires invited me to come along with them to visit the Los Alerces National Park, which is maybe twenty or thirty kilometers from Esquel to the west. We eventually reached the park and reached this big lake and parked at a camping site. The wind was blowing really hard and it was raining a bit, plus it was freezing cold, so we did not stay for very long. But the camping spots around the lake are fantastic, so I reckon in the summer and spring it would be a fabulous place to visit. 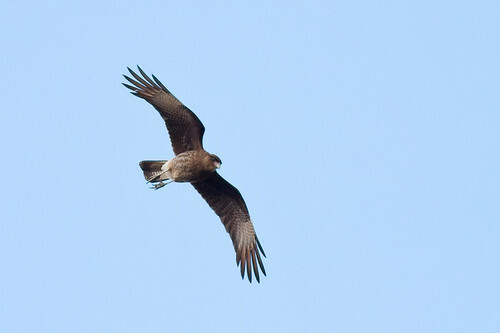 On the way back we saw a Southern Caracara and a Chimango feeding on a rabbit killed on the road at the entrance to the park. The weather was really overcast so I had lots of trouble getting some decent photos. 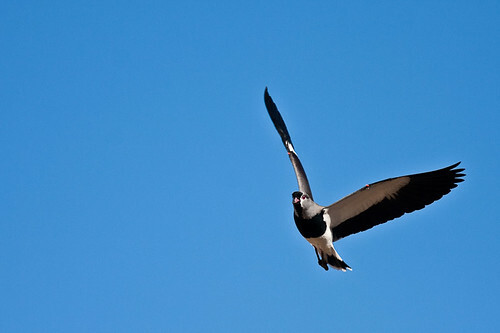 On the way there, I also saw what I thought were a pair of Condors. After that, we headed to Trevellin where we had a Welsh Tea (Te Gales) at Casa de Te Nain Maggie. The tea was out of this world, and I had three cups with milk and sugar. We also had some organic bread, scones and some delicious cakes. The cream in one of the cakes was so rich, that the experience was almost orgasmic. After that, we headed off to the Regional Museum where they had all these artifacts of the early Welsh colonists who came to the area as early as the 1890’s. This morning I just was not interested in going skiing. I have had enough of skiing on sheet ice, so I gave it a big miss today. I walked up the road towards the mountains and followed the train line for a while. I came upon this Austral Thrush in a tree near the track. 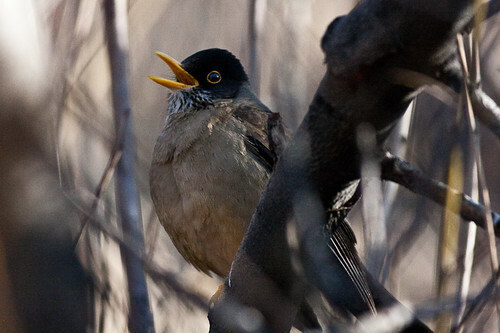 They are locally called a Zorzal and are a sub-species of the nominate species which is based in the Falkland Islands. Their scientific name is Turdus falcklandii magellanicus. 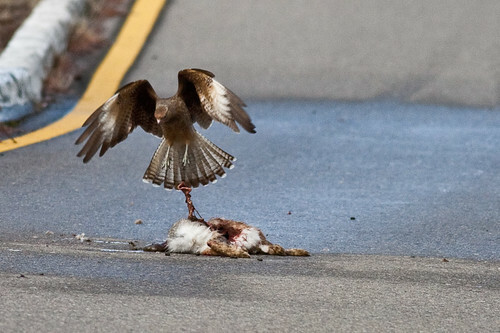 I think that they are also related to the blackbird. 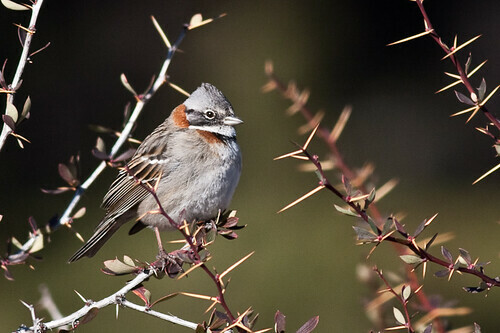 Further up along the track I came upon a bunch of Rufous-collared Sparrows. They are locally called the Chingolo. Their other English name is Andean Sparrow. 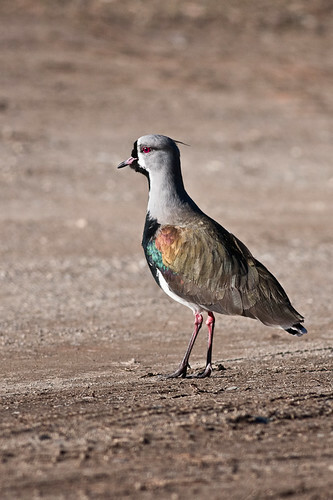 I came down from the train track and then walked through the cemetery where I photographed a pair of Southern Lapwing, or Tero as they are known by the locals in Argentina and Uruguay. The Tero is actually a mascot bird for the Uruguay football team because of their agressive and territorial nature. The Tero is quite common here in Argentina and can be seen on open fields quite close to towns. I see a pair nearly every day in the grounds of the local gendarmes. 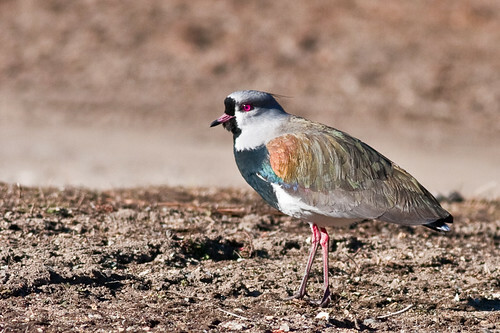 The Southern Lapwing ranges throughout most of South America except for coastal Peru and the Amazon basin. They do not like jungle and stick to open habitats. I have moved down the hill to Esquel. Its heaps better. The hostel is heaps cheaper and there is stuff to do at night. I have to hitch-hike up to the mountain every day but that is okay. It is pretty easy to get a lift. This morning it probably took me about half an hour to wait for a lift. I get to meet lots of nice people that way as well. Usually it is the nice people who give you a lift so it is great. 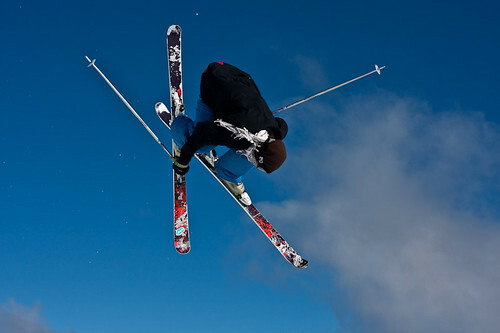 I bought a photo of me skiing. It was taken by the photographers at La Hoya. This is the only one I like because I had ridiculous looks on my face and my skis were all crossed over like a beginner. The snow was very icy and I could not find much soft stuff. 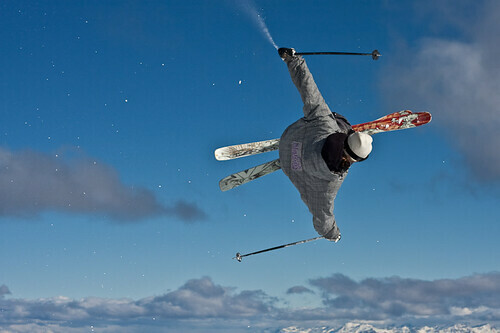 I did not ski for a very long time as I got tired of sliding all over the boiler plate pistes. I do not know if I will go skiing tomorrow. It is really bad. We need some more snow really bad. There is supposed to be some more snow on the weekend or after it. But, and it is a big but, there is only supposed to be a dump of about five centimeters. Which is not much at all. If things do not get better I may be out of here before I planned to. This morning the wind was blowing hard again and there were clouds all over the top of the mountain, so I decided to go into Esquel to do my internet activities. I got a lift within a few minutes and on the way down we came upon a herd of Guanacos on the road. So I asked the kind driver to stop so I could take a photo on my Point and Shoot. I think Guanacos are a kind of Llama or Alpaca. I really have no idea. They are quite often on the road or on the hills above the roads. I think they lick the salt that is put on the roads to melt the snow quicker. 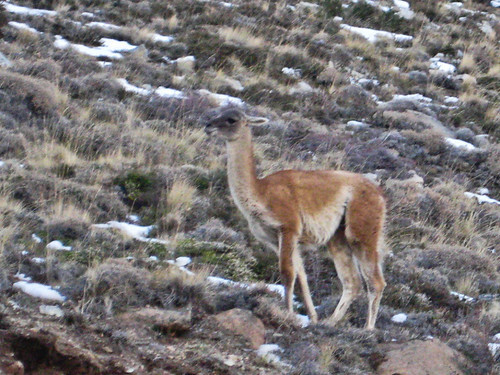 The guanaco (Lama guanicoe) is a camelid native to South America. When I got back up the hill, the upper lifts had been closed so I did not miss much skiing. It was a horrible day and I am glad that I had it off. Well at least it was a sunny day today. It was actually quite warm last night and this morning the temperature was +3 degrees Celsius. I was hoping that some of the ice might get a bit melted. Some of it did, but the majority of the skiable areas were sheet ice. I skied the Plateau piste most of the day and this afternoon I practiced using the outside edges of my skis, so it was not a total waste. Today was a late start and another impersonation of a spring day. It was actually hot. The snow was a bit slushy which is heaps better than ice. We desperately need more snow. More practicing skiing the outside edge. It has started snowing again! Thursday 5th August, 2010. La Hoya, Patagonia, Argentina. I has just started snowing in the last hour or so. Big fat juicy flakes of snow. Hopefully it keeps going all night and in the morning there is a fresh blanket of powder all over the resort of La Hoya. Today the skiing was pretty horrible. All the pistes were very icy and rock hard. 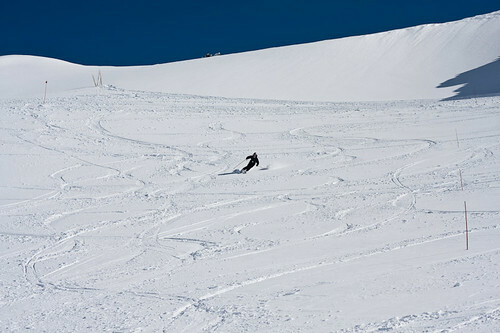 I found a little stash of wind-blown snow on the left side of the Teleski del Sol so I just skied that most of the time. Not very successfully I might add. I also found some wind-blown snow in a little canyon going down towards the beginners’ slopes. I even had a run towards under the cornice but that was rock hard as well. It was even worse than the pistes because it was pitted with holes and ruts as well as being icy. Last night we got very little snow. The wind was howling in the morning and the lifts were all closed. After hanging around for most of the morning, the lifts started up at mid-day. I went to my favourite lift, the Sol and there were drifts of heavy powder in the middle of the piste. So I skied that for a while until I went down for a break. It was pretty horrendous conditions with strong winds and white-out from wind-blown snow. I skied for a couple of hours and then called it quits. The skiing was pretty icy and horrible today so at least I got some shots of the park, which made the day at least not a total waste of time. The dudes were going off at the FlyPark at La Hoya today. There were a couple of guys who were doing 360’s and twists and stuff. So shut up, Steve and show the photos. There were so many good photos that I chose way too many. Too bad. Enjoy. Finally today (3rd August) I got around to taking some skiin photos. Lisa and Talon from Canada obliginly offered to let me take some photos of them. This has been my first time taking photos of skiing with a real camera. Before I had only used the Point and Shoot camera, which is handy for tourist snaps, but not much good for any decent shots. It was freezing this morning again. Talon and Lisa thawed out near the fire while I got ready, then we headed up the quad chair to the Sol poma and went left to the off-piste area. Talon and Lisa took off their skis and snowboard and walked up the hill a bit above the goat track. We got our signals organised and down came Talon. Luckily I had the exposure reasonably correct. I over-exposed about a stop and a half. Talon getting a bit of air after the cut back. Talon came off a bank near a bunch of rocks and then turned away from the camera and stopped just before the goat track. I call them goat tracks. Most people call them cat tracks. Then Lisa came down and did a nice turn off the bank near the rocks. 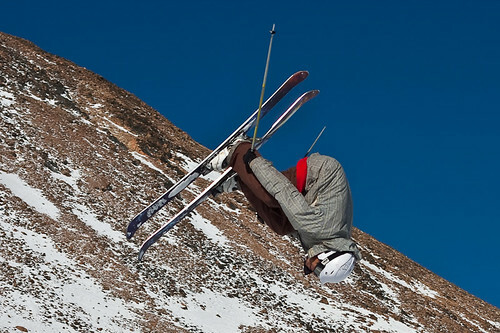 I quite like the look of the skier against the big lump of rock. After that, Talon climbed up the hill again and did another line through some other rocky outcrops. Then we went further along the goat track and I went down the hill while they climbed up to the big cornice right in front of the beginners slopes. Talon came down first and ripped a few turns. I was down near the bottom at the top of a piste above the beginner’s tow. Lisa came down and made a few nice turns. And here doing a nice banking turn away from the rocks. And that was the photos for the day. I was not going to do much skiing but I found a nice stash of wind-blown snow along the edge of the Teleski del Sol, so I practiced turning in some softer stuff for most of the day. In the afternoon, I was going to take some shots of the park with my 50mm lens but the wind came up and the rope tow over there seemed to be closed. But some park action is on the cards for another day.